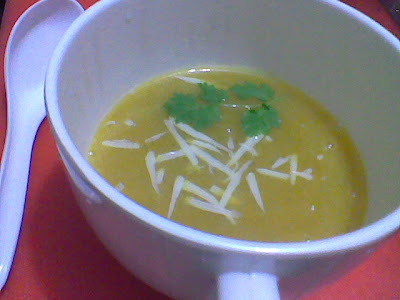 I had some left over pumpkin in the fridge and was pondering over what to do with them when this soup came to my mind. 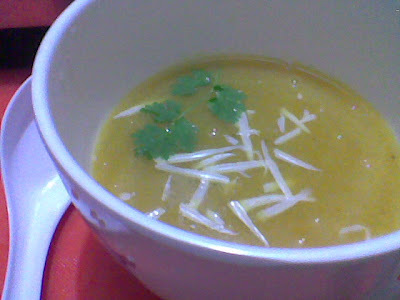 Adding potato to this soup gives it a nice creamy texture and thickness without having to add corn flour to it. A steaming cup of it does wonders on a cold evening. So here goes the recipe…. Scrape the skin of the pumpkin and potato and cut them into chunks. Heat butter in a kadai and add the pumpkin and potato chunks and sauté for a minute. Transfer them to a pressure cooker and cook for 1 whistle. Let it cool. Liquidise them in food processor using water as required to the consistency you would prefer. Pour the soup again in the kadai and bring it to a boil. Season the soup with salt, oregano, basil and pepper powder. Garnish with grated cheese and serve piping hot.